The increment estimation methods of European NFIs were explored by means of 12 essential NFI features. The results indicate various differences among NFIs within the commonly acknowledged methodological frame. The perspectives for harmonisation at the European level are promising. The estimation of increment is implemented differently in European National Forest Inventories (NFIs) due to different historical origins of NFIs and sampling designs and field assessments accommodated to country-specific conditions. The aspired harmonisation of increment estimation requires a comparison and an analysis of NFI methods. The objective was to investigate the differences in volume increment estimation methods used in European NFIs. The conducted work shall set a basis for harmonisation at the European level which is needed to improve information on forest resources for various strategic processes. A comprehensive enquiry was conducted during Cost Action FP1001 to explore the methods of increment estimation of 29 European NFIs. The enquiry built upon the preceding Cost Action E43 and was complemented by an analysis of literature to demonstrate the methodological backgrounds. The comparison of methods revealed differences concerning the NFI features such as sampling grids, periodicity of assessments, permanent and temporary plots, use of remote sensing, sample tree selection, components of forest growth, forest area changes, sampling thresholds, field measurements, drain assessment, involved models and tree parts included in estimates. Increment estimation methods differ considerably among European NFIs. Their harmonisation introduces new issues into the harmonisation process. Recent accomplishments and the increased use of sample-based inventories in Europe make perspectives for harmonised reporting of increment estimation promising. TG: designing and analysing the questionnaire, reviewing and analysing the literature and writing the article. AL: coordinating the working group, designing the questionnaire, programming and running the analysis of the questionnaire, reviewing the literature and developing the article. CV: coordinating the working group, reviewing the literature, developing the article and revising the manuscript. MB, LD, JF, PG, AK, ST: designing the questionnaire, reviewing the literature and revising the manuscript. KS: coordinating the research project, reviewing the literature and revising the manuscript. The demand for information on the changes within forest ecosystems has evolved during the last century and provided a major driver for the methodological development of National Forest Inventories (NFIs). Throughout the decades, NFI methods have been refined and new approaches have been introduced in the inventory design of European NFIs (Gabler and Schadauer 2007). In earlier sample-based inventories, information on the change in forest resources was often obtained by comparing the status at two points in time to determine for example the development of growing stock or forest area. These estimates were basically net changes without giving information on the individual gains and losses that resulted in the overall net change. Repeated measurements as basis for increment estimation were first applied at the local level (Biolley 1921) and later on integrated into sample-based forest inventories by the use of permanent plots (Köhl et al. 2006). Although the monitoring of increment and drain has been subject to efforts in several large-scale inventories around the 1930s, their quantification gained central attention through the emerging information needs in the second half of the twentieth century. The increment and growth of forests is used in monitoring programmes to survey the productivity of forests, carbon sequestration and response of forests to changing environmental conditions (e.g. Charru et al. 2010; De Vries et al. 2009; Dittmar et al. 2003; Ferretti et al. 2014; Fridman et al. 2014; Loustau et al. 2005; Spiecker et al. 1996; Wamelink et al. 2009). The maintenance and encouragement of productive functions of forests is a criterion of pan-European quantitative indicators for sustainable forest management (FOREST EUROPE, UNECE and FAO 2011a). Accordingly, the balance between increment and fellings is considered decisive for the availability of wood at present and in the future, and the fellings should not exceed increment in the long run for shaping a stable growing stock. The relation of increment and fellings is used as a sustainability indicator both at country and European level. The potential of forests for carbon sequestration has gained importance through the United Nations Framework Convention on Climate Change (UNFCCC) (United Nations 1992) and its Kyoto Protocol (United Nations 1998). The gain-loss method as given in the IPCC guidelines (IPCC 2006a) requires the biomass increment as gain and the biomass removal as loss to calculate the annual increase or decrease in carbon stocks. Contrarily, the stock-difference method estimates the difference between the biomass stock at time t 2 and time t 1. The influence of climate and deposition on stem increment is part of the assessment system of the European forest condition monitoring (e.g. Seidling et al. 2014). European NFIs are well placed to provide information and data to many of the mentioned international reporting processes. Usually, NFIs estimate the increment for the periods between two consecutive assessments according to country-specific increment definitions and usually report the annual mean of the periodic increments. Estimates reported by NFIs are total values and values per hectare of forest land. In international reporting (FAO 2012; FOREST EUROPE, UNECE and FAO 2011b; IPCC 2003, 2006b; UNECE/FAO 2000) but also at country level, a distinction is made between gross increment and net increment. While gross increment is equal to the total volume increment, the net increment is obtained by subtracting the volume of natural losses (UNECE/FAO 2000) or the volume of natural mortality (IPCC 2006b) from the gross increment. NFIs that use permanent plots base their volume increment estimation frequently on differences in individual tree volumes between two measurements. NFIs with temporary plots use radial increment obtained from increment cores as input to a model to predict the volume increment or the volume at the previous point in time. Also, yield tables are used to estimate volume increment. Based on these findings, further and more detailed investigations on the methods of volume increment estimation were conducted during Cost Action FP1001 (2014). The objectives of these investigations were to compare the methods, to find out the differences between NFIs and to examine the implementation status of increment estimation because several European countries have recently established or initiated sample-based inventories. The differences in methods were explored for 12 NFI features that have been identified by Working Group 1 of Cost Action FP1001 (2014) as cornerstones in the increment estimation process. The investigations were complemented by an analysis of literature sources to demonstrate the methodological backgrounds. 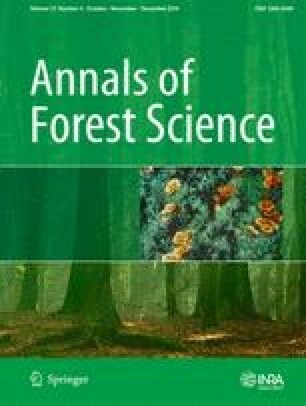 The findings from this study are discussed and summarised and conclusions are drawn with regard to the harmonisation of forest resource information. As such, the intention of the presented work is to identify relevant points for harmonising increment estimation and to provide a basis for harmonisation at the European level which is required to satisfy the demand for improved information on forest resources relevant for the decision-making processes in the forest, environment, wood industry and energy sectors. A comprehensive questionnaire was prepared by Working Group 1 of Cost Action FP1001 (2014) to explore the approaches applied by European NFIs for estimating the changes in forest resources. The enquiry was designed as a two-stage information collection procedure. The first stage included the elaboration and compilation of the essential questions, the collection of the responses from NFI experts and the analyses of the provided information. In the second stage, the questionnaire was reviewed, refined and resent to the NFI experts. This two-stage procedure turned out as favourable in the preceding Cost Action E43 (2010) to ensure a good quality of the collected information (Vidal et al. 2008). The responses were collected via an online survey and compiled in a database. Plausibility checks were made at the first and second stages of the enquiry and included cross-checks between corresponding questions and comparisons with additionally drafted country reports that contained further descriptive information related to the availability of forest resources. The questionnaire built upon the information collected during the preceding Cost Action E43 (2010). These earlier compilations focussed on the status of forest resources and particularly on forest area and growing stock and on their harmonisation. However, Tomppo et al. (2010) compiled NFI reports from 37 countries worldwide which partially also contain overview descriptions about volume increment estimation. To develop the content of the questionnaire, the already available information was taken into consideration and additionally complemented by an analysis of literature and by expert opinions of the members of Working Group 1 of Cost Action FP1001 (2014). The essential NFI features with regard to increment estimation were identified by the Working group members during various meetings and individual contributions and by taking into account the criteria of relevance to participating NFIs, influence on the comparability of estimates and importance for describing the overall situation of increment estimation. Altogether, 12 NFI features have been identified as essential. The identified NFI features can be attributed to the different methodological areas of forest inventories and refer to sampling design, field measurements and assessments, and the application of models and calculation of up-scaled estimates and include sampling grids, periodicity of assessments, permanent and temporary plots, the use of remote sensing, sample tree selection methods, components of forest growth, forest area changes, field measurements and assessments, the defined sampling thresholds, the use of models and tree parts included in estimates (Fridman et al. 2014; Hush 1963; Loetsch and Haller 1964; Loetsch et al. 1973; Köhl et al. 2006; Shiver and Borders 1996; Spurr 1952; Tomppo et al. 2010). The enquiry consisted of more than 200 individual questions. In total, 29 European countries participated and provided information on their approaches of change estimation at country level (Fig. 1). According to the most recent Report on the State of Europe’s forests (FOREST EUROPE, UNECE and FAO 2011c), these countries altogether have a forest area available for wood supply of 143 million ha, a growing stock of 22,530 million m3, yielded a net annual increment of about 740 million m3 and provided fellings of about 480 million m3 per year. The differences in volume increment estimation methods among the 29 participating countries are presented for the 12 NFI features in terms of numbers of countries, and their forest area, growing stock and net annual increment of forest available for wood supply. The results from the enquiry are presented together with the findings from the analysis of literature. The NFI features are underlined by selected examples from participating NFIs that in many cases represent favourable starting points for achieving harmonised increment estimation. The differences in volume increment estimation methods are presented for the 12 investigated NFI features and generally refer to gross and net increments; however, the assessment of drain (Section 3.9) relates more to the calculation of net increments. Some of the NFI features can be considered independently from each other, whereas others are mutually linked and show thematic overlaps. About 30 % of the participating NFIs are in an intermediate stage of establishing or initiating sample-based inventories. Therefore, the status of implementation of increment estimation procedures varies between the NFIs. Frequently, these NFIs have completed the first but not a second inventory cycle. Some NFIs still include components of stand-wise surveys for estimating the increment at country level. In a few countries, the last forest inventory was conducted more than 10 years ago. Nevertheless, in order to draw an overall picture on the current situation, all available information on approaches was integrated in the comparison. If no information was available from NFIs regarding particular features for the moment, they were assigned in the presented result tables to the category “other” (Table 2 on time span between inventories), or we referred to growing stock estimation (Tables 9 and 10 on the minimum diameter at breast height (dbh) and tree parts included in estimates). The sampling grid constitutes the framework for sample-based data collection in environmental monitoring programmes. Most NFIs include systematic sampling components based on two-dimensional grids; however, the grid spacing varies considerably among NFIs (Lawrence et al. 2010). The sampling grid is part of the overall sampling strategy of NFIs. Köhl et al. (2006) basically distinguish between sampling without auxiliary information and sampling with auxiliary information and furthermore present simple random sampling, systematic sampling, cluster sampling as alternatives for the first, and stratified sampling, multi-phase sampling and multi-stage sampling as alternatives for the latter. NFIs frequently split their overall grid into portions of annually assessed sub-grids. These can be either interpenetrating panels annually covering the whole country (Van Deusen 2002) as for example used in Finland, Sweden and Norway, or regional panels covering each year other country regions as for example in Spain. Table 1 gives an overview how many NFIs split the whole grid into annual sub-grids representative for the whole country and how many NFIs do not distinguish between sub-grids as basis for estimation. The distinction of sub-grids is often connected with annual or “rolling” inventory systems meaning that the whole country is inventoried each year and that assessments continue without break after the last sub-grid is completed. Such inventory systems are installed for example in the Scandinavian countries, Estonia and Lithuania for producing yearly updated results. Countries conduct NFIs at more or less regular time intervals depending on the information needs at country level, national budgetary planning and international reporting obligations. The periodicity of assessments implies two aspects: the number of years to complete an individual NFI cycle and the number of years between consecutive NFIs. The duration of an individual NFI varies among countries and generally ranges from 1 to 10 years. In many NFIs, an individual NFI cycle lasts for 5 years as for example in Denmark, Estonia, Finland, Iceland, Lithuania, Latvia, Norway and Sweden. According to Lawrence et al. (2010), the time spans between consecutive inventories are typically 5 or 10 years. Some countries as for example Germany, Italy and Slovakia have periodic inventories in which an NFI is completed in a few years and then is repeated 5 or 10 years later, respectively. Increasingly countries move towards annual or “rolling” inventories in which 20 or 10 % of the plots are measured each year, the annual sub-grids cover the whole country and measurements recommence as soon as the whole grid is completed. Table 2 shows the time spans between consecutive assessments of European NFIs. “Other” time spans include countries that conduct inventories at intervals of 6, 7 or more years, at mixed intervals of partly 5 and partly 15 years, and countries having currently no information. The use of permanent and/or temporary sample plots is a basic difference with regard to increment estimation. Permanent sample plots allow the calculation of increments from consecutive measurements using calliper or tape at time points t 1 and t 2. On temporary plots, only the tree size at t 2 can be directly measured; therefore, increment cores are taken to obtain the radial increment for a specified number of year rings. For conifers, also height increments are frequently measured or visually estimated for the whorls of the time span between t 1 and t 2. The basic features of permanent and temporary sampling systems are compared in Table 3. European NFIs use both permanent and temporary sampling systems, although most of them are based on permanent plots. A combination of permanent and temporary plots is for example used by Lithuania and Sweden (Fridman et al. 2014). Usually, these NFIs have developed and implemented algorithms to combine the increments for obtaining overall estimators (Kuliešis et al. 2003). NFIs based on permanent plots from time to time may include a temporary sub-grid as part of their quality assurance and quality control procedures. Table 4 gives an overview on the use of permanent and temporary plots by the European NFIs. Several of the NFIs using permanent plots have actually recently established a permanent sampling system having up to now completed only one sample-based NFI. These NFIs also rely on increment cores and height increments assessed on whorls as long as only one field assessment at t 1 is completed on the permanently established plots. As the destructive impact of coring may lead to deformation of the stem cross-sectional area (Schöpfer 1962), such NFIs usually sample the increment cores outside the plot, while temporary inventories commonly take the cores from sample trees. Also NFIs with a permanent sampling system may collect increment cores, from outside the plot or from the temporary plots when a combination of temporary and permanent sample plots is used, to gather information about the annual fluctuation of increments. NFIs in Europe develop towards multisource NFIs that increasingly integrate data from additional digital sources like remote sensing material, land-use maps, elevation models and other cartographically mapped information. These multisource approaches enable small-area estimates and wall-to-wall maps and close the information gaps of terrestrial sampling alone (Tomppo et al. 2008). Their use in NFIs ranges from visual interpretation of aerial photographs to automated data processing, information extraction and mapping by linked GIS applications. With regard to increment estimation, remote sensing methods have only an ancillary role in the assessment and estimation process for first-phase land cover/use classification, pre- or post-stratification, or for the detection of forest area changes (e.g. Denmark, France, Ireland, Italy, Norway and Switzerland). However, remote sensing methods have been investigated to test their capability for increment estimation (e.g. Härkönen et al. 2013; Naesset and Gobakken 2005). European NFIs use basically three different sampling techniques for selecting the sample trees (Table 5). Most frequently applied are concentric sample plots (e.g. Belgium, Czech Republic, Croatia, France, Ireland, Romania and Switzerland). Usually two or more circular plots of different sizes are arranged at the common central point. Angle-count sampling (Bitterlich 1948, 1952, 1984) is frequently referred to as horizontal point sampling and is conducted by three countries (Austria, Finland and Germany). Concentric plots can be regarded as an intermediate approach between circular fixed-area plot and angle-count sampling (Gabler and Schadauer 2007). The use of fixed-area sample plots leads to a relatively large number of sample trees in young and dense stands, whereas in old and sparse forests, the number of sample trees is low. Therefore, concentric circular sample plots are preferred by NFIs to achieve a balanced selection of sample tree sizes. Also concentric circular plots of variable plot sizes depending on the stand density are used in some cases. Fixed-area plots are usually used in combination with angle-count sampling or concentric circular plots for the sampling of small dbh classes (e.g. in Austria, Slovakia and Latvia). The fixed-area plots for small trees are either satellites or located in the plot centre. Table 5 shows the sample tree selection methods used by European NFIs. Several NFIs select within the sample trees a sub-sample for time-consuming measurements like tree height and upper diameter. The sub-sample selection is usually a systematic selection of every n th tree or every n th tree fulfilling a defined size threshold. Also angle-count sampling with large basal area factors of e.g. 12 m2/ha or adjustable basal area factors is used to select the sub-sample trees. In permanent sample-based NFIs, increment estimation relies on definitions that are usually formulated by means of components of growth. Beers (1962) generally divides the change in volume between two points in time t 1 and t 2 into survivor growth, mortality, cut and ingrowth. These change components apply to full census of forest stands and also to permanent sample plot designs. For horizontal point sampling, but also for concentric circular plots, the additional components of ongrowth and non-growth trees (e.g. Eriksson 1995; Martin 1982; Roesch et al. 1989; Shiver and Borders 1996; Van Deusen et al. 1986) have to be taken into consideration. The individual components of forest growth are described in Table 6 in accordance with Martin (1982). The components are defined by two criteria, whether the minimum dbh is reached or not, and whether a tree is in the sample or out of the sample. In or out of the sample means that a tree is either associated or not associated with a sample tree selection method. For example, to qualify as sample tree in angle-count sampling, a tree has to be larger than a defined horizontal angle. This can be the case for trees below and above the dbh threshold; however, both are associated with the angle-count sample although only the tree above the minimum dbh belongs to the collective of sample trees. The components of forest growth are taken into account differently by NFIs to estimate the increment between t 1 and t 2. Various estimators have been developed for permanent horizontal point samples (e.g. Eriksson 1995; Flewelling 1981; Flewelling and Thomas 1984; Gregoire 1993; Roesch et al. 1989; Van Deusen et al. 1986). The different dbh thresholds applied in concentric circular sample plots lead to similar growth components and related problems for increment estimation (Hébert et al. 2005). European NFIs reveal two basic strategies of increment estimation, either to produce conservative estimates or to cover all possible growth components. Conservative estimation usually includes only survivors and ingrowth trees, whereas the others also take the increment of cut and mortality trees into account (e.g. Sweden, Belgium and Spain), and in case of angle-count sampling also the increment of ongrowth and non-growth trees. In addition to the mentioned components of forest growth, NFIs have to deal with some other issues of change. These include commonly forest area changes but also more rare changes like survivor trees that have downed but remain growing, survivor trees that change from normal to unusual tree shapes or in-, on- and non-growth trees that enter the sample but die before the measurement at t 2. Many NFIs have established rules how these change components are treated in the increment estimation process. Afforestation, reforestation and deforestation (ARD) terminologically originate from the international reporting nomenclature (FAO 2000, 2001, 2004, 2010, 2012; IPCC 2003, 2006b) and imply a land-use transformation from non-forest to forest and vice versa. This means that the forest definition and the contained quantitative thresholds like minimum area, width, tree crown cover and tree height as well as the qualitative variables for land use (Vidal et al. 2008) are satisfied at one point in time but not at the other. Although ARD areas do not constitute forest land at t 1 or t 2, they can produce increment during this time span. Examples are trees that are left standing after deforestation or large enduring trees that were present before afforestation by planting. Similar situations may arise within the forest area, when for example a piece of forest land changes the management type from production forest to protected forest. Examples of European NFIs that include the increment on land subject to ARD in the estimates are Finland, France and Germany. NFIs measure and assess various variables on their sample plots and compile comprehensive data sets (Tomppo et al. 2010). These data can be grouped into sample tree-, stand- and site-specific variables. Sample tree-specific variables include tree species, dbh, tree height, upper diameter, crown parameters like crown length or crown class, and social position. Upper diameters are measured by the NFIs of Austria, Czech Republic, Germany and Switzerland. When temporary sample plots are used, usually the radial increment is measured on increment cores, and in some cases, also height increment of conifers is visually estimated. Other sample tree-specific variables involved in increment estimation are tree age, bifurcation and bark thickness. Stand-specific variables include stand productivity, stand age, dominant height and stand density but are relevant to increment estimation procedures only in a few NFIs. Site-specific variables are basically the growth region and height above sea level. Table 7 gives an overview about the most frequently used variables in volume increment estimation. All other mentioned variables are used by not more than in one NFI. At first glance, increment and drain may be considered as separate issues. However, they are connected in two ways through cut trees and natural losses. Cut trees are one of the components of forest growth described by Martin (1982) and contribute to increment as long as they are growing. The amount of natural losses is required for the calculation of net increments (e.g. FOREST EUROPE, UNECE and FAO 2011b; IPCC 2003; UNECE/FAO 2000). Drain assessments are basically different on permanent and temporary plots. While on permanent plots, the trees removed since the last inventory can be identified if sample tree locations are known, on temporary plots, the assessment must rely on remaining stumps and other signs. So-called stump surveys include the measurement of stump diameters and stump heights and the assessment of the felling year. Another method is to measure a representative remaining tree (Loetsch et al. 1973; Zöhrer 1980). In some cases, also increment cores are taken from stumps. For the purpose of drain estimation, NFIs frequently distinguish between different types of harvesting or losses. These include tending activities like pre-commercial thinning, thinning, selective cutting, regeneration felling and final felling at the end of the stand rotation. Several NFIs assess natural losses as own category and some like the NFIs of Belgium, Estonia, Lithuania and Latvia distinguish between types of natural losses such as snow, wind, fire, insect infestation or competition. Table 8 gives an overview about the assessment of harvest types and types of natural losses in European NFIs. NFIs define and apply several thresholds for the measurements and assessments. These thresholds specify for instance the part of a countries’ land area that is sampled or the part of the tree population that is sampled, or define classes within the sampled land area or the sample trees. Directly relevant for increment estimation are the thresholds as specified in the forest definitions like minimum area, minimum crown cover and minimum width in case of linear tree formations like shelterbelts (Vidal et al. 2008), and the minimum dbh for sample trees (Gschwantner et al. 2009). The thresholds in forest definitions are relevant in connection with forest area changes from and to forest land. The minimum dbh specifies the trees included in the estimation and is relevant for the growth components that grow into the collective of sample trees by reaching or exceeding the minimum dbh between t 1 and t 2. Usually, the minimum dbh defined for increment estimation is equal to the minimum dbh applied for growing stock to ensure consistency between the estimates. However, the thresholds applied by a NFI can be different for living trees, dead trees and stumps. Table 9 shows the minimum dbh for living trees applied by European NFIs. The dbh thresholds range between 0 and 12 cm and are nested around 0, 5, 7 and 10 cm. Several NFIs, for example from Austria, Germany, Italy, Norway and Slovakia, collect also data for small trees below the dbh threshold for other purposes like regeneration surveys. Several kinds of models are involved in the estimation procedures of NFIs. Depending on the applied models and estimation algorithms, different variables are used and have different roles in the increment estimation procedures as stratification variables, explanatory variables or even response variables. The applied models include height curves (e.g. Kuliešis et al. 2014), height increment models and other data models to predict missing measurements like upper diameters (e.g. Korhonen 1992; Schieler 1997), tariff functions (e.g. Kaufmann 2001), bark thickness models (e.g. Cellini et al. 2012; Laasasenaho et al. 2005), models to predict the dbh from stump measurements, models for growth components that have been measured only at one time point t 1 or t 2 and volume and biomass models (e.g. Zianis et al. 2005). Also, yield tables and growth simulators may be used to obtain increment information if other data sources are not available. NFIs use also dbh and height increment models to predict the increment of sample trees that have not been cored or also for bias correction of estimates (e.g. Kuliešis et al. 2003). In general, the kind of used models varies considerably among NFIs and depends very much on the established estimation procedures. However, most NFIs use the same volume models for growing stock estimation and increment estimation. The models applied for growing stock and volume increment estimation were in most cases developed from data sources other than the NFI sample plot data. These usually very comprehensive data compilations were used to parameterize volume models with different target volumes concerning included tree parts. Merchantable volume for example includes the stem volume above the stump up to a merchantable top diameter of e.g. 7 cm. The stem volume from ground surface up to the stem tip describes potentially available stem wood. The stem volume from stump height up to the stem tip corresponds to the reference definition of Cost Action E43 for growing stock (Lanz et al. 2010). Target volumes are either estimated over or under bark and some NFIs also include large branches. The measurement of increment cores often includes only the woody part and not the increment of bark due to the difficult assessment. While the consecutive measurements at permanent plots include the increment of wood and bark, the use of increment cores implies the application of bark thickness models to obtain increments over bark. However, Gschwantner et al. (2009) provided a hierarchical partitioning approach that allows specifying any target volume or biomass estimate on the basis of defined tree parts. Table 10 shows the tree parts included in volume and increment estimates by European NFIs. The results of this study represent the status quo of increment estimation methods and can be expected to be subject to changes in the future. Recently established or initiated sample-based NFIs not always have completely developed their estimation procedures, whereas in NFIs with long-term experience, the estimation of increment is implemented as a standard procedure. However, the approaches of NFIs change through time as techniques advance and new information demands arise (Tomppo and Schadauer 2012). Information about increment gained increasing importance in recent decades and thus also became subject to harmonisation efforts within Cost Action FP1001 (2014). The harmonisation approach for European NFIs accepts the premise that countries have developed NFI features over time such as sampling designs and plot configurations to accommodate their country-specific conditions and purposes, and acknowledges that NFIs are justified in their desire to maintain their unique features (McRoberts et al. 2010). To achieve comparability of estimates, harmonisation focuses on the elaboration of common definitions and on the development of procedures for producing estimates according to these definitions while maintaining the methodological framework of NFIs. The reference definitions for gross and net increment established for European NFIs under Cost Action FP1001 (2014) define a dbh threshold of >0 cm (minimum height = 1.3 m), specify the bole (wood and bark) and stem top as included tree parts, include the increment of all growth components and mention a reference period and natural losses which have to be specified depending on the reporting purpose. For producing estimates according to these definitions, the harmonisation efforts will primarily relate to the criteria contained in the reference definitions and to the techniques of implementing harmonised estimation through extended data collection and model application. Thus, the 12 NFI features can be distinguished into two groups, whether they are a target for harmonisation or not under the established harmonisation approach for European NFIs. Table 11 points out the NFI features that are subject to harmonisation efforts and briefly states the related issues to be solved for harmonisation. Sampling designs and plot configurations of European NFIs have been developed to accommodate the unique topographies, climates, forest types and commercial interests of European countries (McRoberts et al. 2010) and belong to the methodological framework of NFIs which are not a target of harmonisation efforts. This includes the sampling grid and its characteristics such as grid sizes, clustering, plot numbers per cluster and the use of sub-grids, as well as the use of permanent and/or temporary plots, and the applied sample tree selection methods. As a consequence of different sampling designs, also the calculation procedures for population means and variances are different. In a definition-based harmonisation approach, the aim of comparability is reached when the estimates are in accordance with a common reference definition, and the calculation procedures themselves are not considered as source of divergence. However, the level of harmonisation can be enhanced through the development of harmonised up-scaling procedures which is also an aim of the European harmonisation process for NFIs. Remote sensing as part of sampling designs has until now only a subordinate role in increment estimation as ancillary information source for stratification or pre-decision for terrestrial forest area change assessment. However, increment estimation may get increasingly in the focus of interest in remote sensing research providing new questions in relation to the comparability of such estimates obtained from different methods. NFI features that are subject to harmonisation efforts under the harmonisation approach established for European NFIs comprise the assessment periodicity, growth components and forest area changes, field measurements and assessments, drain assessment, sampling thresholds, model use and included tree parts (Table 11). To convert the country-level estimates into estimates according to a common reference definition, different methods can be applied. They can be adjusted by simple conversion factors but also by more elaborate adaptations. Depending on the nature of the deviations and already existing data, different procedures can be developed to harmonise increment estimates. Ståhl et al. (2012) classify the conversion methods into reductive, neutral and expansive bridges. Examples of bridges are given by McRoberts et al. (2010), Ståhl et al. (2012) and Tomter et al. (2012). Furthermore, Ståhl et al. (2012) state that harmonisation can be realised at two main levels: at the level of individual sampling units like trees or plots or at an aggregate level like up-scaled country or sub-country results. However, as harmonisation options depend on the nature of the available data and can take different forms in the countries, they are discussed subsequently in a general manner and by pointing out particular possibilities. Harmonisation regarding common reference periods relates to the spatio-temporal pattern of field assessments in European NFIs which is relevant with regard to the possibility of producing yearly estimates (Heikkinen et al. 2012). NFIs are conducted by countries depending on the respective needs for information about forest resources, budgetary planning and international reporting obligations. Consequently, the increment estimates of European NFIs do not refer to the same periods in time. Continuous NFIs with e.g. annual samples of one fifth of the whole grid can report by default according to “moving” 5-year periods. Discontinuous NFIs require other techniques to report according to harmonised reference periods. From periodic increments as estimated by NFIs, annual increments can be derived for example by the annual ring width variations obtained from increment cores or by applying iterative modelling methods (Cao 2000; Weiskittel et al. 2007). The annualised increments can be used for producing increment estimates for specified reference periods. The distinction of sample trees into growth components is a feature of permanent sample plots in contrary to temporary plots where the identification of cut and mortality trees is difficult. The distinguishable components of forest growth on permanent plots depend on the sample tree selection method. The main differences between NFIs concern the treatment of sample trees that have been measured only once at the first point in time t 1 like cut trees or at the second point in time t 2 like ingrowth, ongrowth or non-growth trees. In line with the definition of UNECE/FAO (2000), the reference definition for European NFIs includes the increment of all trees measured to a minimum dbh of 0 cm and consequently requires the inclusion of all distinguishable growth components. Therefore, the increment of trees which are measured only at one time point, t 1 or t 2, has to be predicted to obtain estimates according to the reference definition. Single-tree growth simulators but also simpler model applications can be applied to predict the increment of these trees. Trees on afforestation or deforestation areas constitute similar growth components that have only one measurement at t 1 or t 2 and whose increment can be predicted with models. The most important sample tree measurements and assessments used by NFIs for increment estimation are tree species, dbh and tree height. Several NFIs also use upper diameters, crown parameters and diameter increment. Growth regions are frequently used to capture regional differences. Variables such as social position, stand productivity, stand density or height above sea level are also used for the estimation of increment. For the harmonisation of increment estimation, NFIs can be required to use additional but already existing data in their databases or to collect additional data on sample plots. For example, data on trees below the national dbh threshold are necessary to estimate the increment of trees in the low-diameter range. During the last years, many NFIs have established additional fixed-area plots at the sample plot locations for the sampling of small trees below the dbh threshold as for example in regeneration surveys (e.g. Rondeux et al. 2010; Polley et al. 2010; Gasparini et al. 2010) and set an important basis for harmonisation. The additionally collected data serve as input variables for models (e.g. for small trees) which may already exist or firstly have to be developed for the purpose of harmonisation. Different kinds of models or model sets are involved in the increment estimation procedures of NFIs and include e.g. height curves, tariff functions, increment models for growth components that were measured only at one time point t 1 or t 2, and volume and biomass models. Adaptations of existing volume models or additional models can be required to enable harmonised increment estimates that include for example the increment of missing tree parts, trees below the minimum dbh or for growth components that are not included. Taper curves are in general more flexible and allow the calculation of different stem segments and thus also in line with a common reference definition. Form factor functions can be parameterized to include all stem parts as specified by the reference definition if the required original data sources are available. Alternatively, factors can be derived to account for the increment of the stem top or the stump above ground. Data on small trees below the dbh threshold are collected by many NFIs. Frequently, these data are stem counts by dbh classes. Such data were used by Tomter et al. (2012) to estimate the stem volume of small trees below the dbh threshold by applying different model types. Similarly, the data can also be used to estimate the increment of trees below the dbh threshold in different ways, either based on repeated assessments at time points t 1 and t 2, or by model application to predict the increment based on a singular assessment at t 1. Repeated observations that include measurement of diameters of small trees instead of stem counts improve the possibility to predict increments of small trees below the dbh threshold. Furthermore, Tomter et al. (2012) fitted the distribution function of Weibull (1951) to cumulative probability curves obtained from country level growing stock estimates classified by dbh classes, and also power functions to ratios of growing stock in consecutive dbh classes. These approaches can be explored for their applicability regarding increment estimates at country level. Drain assessments are conducted by many NFIs by recording types of harvests and types of natural losses during their field assessments. The distinguished types vary among countries and indicate the need for a common understanding of this quantity to harmonise the estimates of net increments. The broad range of interpretation possibilities is indicated by international definitions (FAO 2012; FOREST EUROPE, UNECE and FAO 2011b; IPCC 2003, 2006b; UNECE/FAO 2000) which subtract from gross increment either a quantity denoted as natural losses or a quantity denoted as natural mortality to obtain net increments. While IPCC (2006b) says that “mortality refers to trees dying naturally from competition in the stem-exclusion stage of a stand or forest” and “does not include losses due to natural disturbances”, the natural losses according to UNECE/FAO (2000) include any “mortality from causes other than cutting by man” which are exemplified by “natural mortality, diseases, insect attacks, fire, windthrow or other physical damage”. Therefore, the development of a common classification scheme that divides drain into defined and disjoint classes of felling types and types of natural losses is crucial for the harmonisation of net increments but also wood supply-related estimates at the European level. The methods for volume increment estimation differ among European NFIs in many ways. The differences as analysed for 12 essential NFI features provide new issues regarding the harmonisation of forest resource information. Until now, the harmonisation of European NFIs has focused on the status of forest resources as described by forest area, growing stock and above-ground biomass and was dealing for the two latter mainly with dbh thresholds and tree parts included in estimates. The extension of harmonisation efforts towards change estimation introduces time-related issues such as reference periods, components of forest growth, forest area changes and natural losses into the ongoing harmonisation process. The 12 analysed NFI features have different roles in the estimation process and different impacts on the comparability of increment estimates. Reasonably, harmonisation efforts should first concentrate on the issues having a major influence on the estimates. Although depending on the respective situation in countries, the issues of growth components, tree parts and dbh thresholds can be assumed to be of primary relevance. Concerning components of growth and forest area changes, substantial experience is available from several NFIs that could be used for unifying their inclusion in harmonised increment estimates. Regarding dbh thresholds and included tree parts, experiences from growing stock and biomass harmonisation (e.g. Tomter et al. 2012; Ståhl et al. 2012) can be used to extend the efforts towards increment estimation. The conceptual contributions of Vidal et al. (2008), Gschwantner et al. (2009), Gabler et al. (2012), McRoberts et al. (2010), Ståhl et al. (2012), Tomppo and Schadauer (2012) and Tomter et al. (2012) provide the guideline for the development of harmonisation options. In view of the harmonisation efforts and achievements during Cost Action E43 (2010) and subsequent projects, and given that several European countries have recently established or initiated sample-based NFIs as statistically sound and objective information source, the perspectives to harmonise volume increment estimation are promising. We are grateful to all participants involved in Cost Action FP1001 and especially want to thank all NFI experts that contributed to the numerous productive discussions within Working Group 1 and provided valuable information about the approaches of increment estimation applied within their NFIs. We would like to thank Cost Office for the support provided for our work in financing meetings, short-term scientific missions and administrative activities. We also would like to thank the anonymous reviewers for their helpful and constructive comments and suggestions. The study was conducted as part of Cost Action FP1001 “Improving data and information on the potential supply of wood resources—a European approach from multisource National Forest Inventories (Usewood)”. It was supported by the European Union through the European Cooperation in Science and Technology (Cost) programme.